Today it was announced that Detroit has a new archbishop to replace the retiring Cardinal Maida. Bishop Allen Vigneron will take archbishop’s chair and receive the pallium. I served on a Board of Directors for several years with Bishop Vigneron and found him to be very orthodox, astute, detail-oriented and faithfully Catholic. 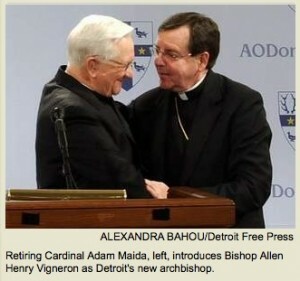 I pray for him as he steps into the important position as shepherd of 1.4 million Catholics that live in Metro Detroit. To read the news release by our local paper, click here. The news from Catholic World News is here. Here is a video of a woman attacking the Pope at a midnight Mass, presumably over the issue of homosexuality. Read also about the homosexual vandalization of a Catholic Church in San Francisco. Catholics will certainly be the targets as things heat up. Why? Because we speak the truth about morality, sexuality and live in general. We have been hated by the media and the secular culture but it could get a lot worse. Why weren’t these events and others like them reported in the media? If Obama had been attacked in such a way it would have made headlines.